I will get straight to the point since I have so much to share. Some weird things have happened since the morning of September 12, 2014, the day 1,009,964 people viewed the story of my life. It was my second article to get big traffic, and since then my life has become a bit intense at the crossroads of freelancing, startup-ing, and blogging. I am starting to come up with a set of tactics that have been working repeatedly for getting huge traffic and visitors, and turning them into subscribers or followers across all networks. My findings come from online marketing, managing social media and growth for the businesses of friends and clients, and my own work. But most of what I’ve learned comes from content marketing and writing, especially from the 21 ghostwriting pieces I’ve written for clients over the last few months and from five personal articles on my Medium blog. Below, I also shared the latest stats of the Medium pieces and some translations including the first few weeks performance of the article you are reading now. First, I have to admit that not every article became a hit. Among those 26 essays, only five of them got 6-digit pageviews. Two of them are reaching 81K and 54K at the time of writing, while the rest currently average around 8.3K each. However, the performance is quite pleasing since many of the big blogs I have known average around 1K-10K visitors per article. I also managed to test a different writing style in a different industry with almost every single article. …you are looking for pro writing tips. I am not a professional writer, nor can I write a mind-blowing literature piece in English. This guide is instead for people like me, who don’t have the best writing skills or the budget to spend on clicks, but who need to grab the attention of their audiences through organic storytelling. This is for people who believe that from their little desk in their little rooms from the middle of nowhere, they can generate more traffic and visitors than those companies with an army of writers. This is an article sharing what I’ve learned, and please note, pageviews or followers count don’t necessarily mean success or good content. This is to help you get read in an extremely noisy world, and turn those readers into long-term members. Part 1 — Before writing: Preparing for the storm & Setting the right engines in place. Part 2 — Writing: Writing style and essentials of an article that will get huge traffic. Part 3 — Ready to publish: Things to do when you are ready to hit the publish button. Part 4 — Post-publishing: How to get into big media outlets, how to double your blog traffic with redistribution, and some other channels no one thinks of. People give you a chance by landing on your article among so many other open browser tabs that distract them. Traffic also disappears very quickly and no one remembers your name the next morning. By setting the right engines in place, you get the “second chance” — the “second touch” point through which you can reconnect with those visitors and remind them it was you who wrote that article. For a long time, I ignored the advice of one of my favorite marketing guys, Noah Kagan, and I decided to place an email subscription form on my website only after more than half of my traffic was gone. I was too late and was able to collect only 32K email addresses. After all those email campaigns, I have to confess that email is now by far the most effective marketing tool that works for me and for almost every one of my clients with no exception. That’s how I get the first 100 shares. It’s the people I bring in by email who give me the first boost and put my work in front of many other people, giving it a chance to spread further. Set up an email subscription form before it’s too late. Finding the right engine depends on your goals. What do you want your readers to do while they’re reading, or once they finish reading your story? Follow you on Instagram? Create an account? Read another post? Watch a video? Fill out a form? Refer a friend, share, or comment? If your goal is, let’s say, to get your “second chance” on Twitter, did you put your Twitter handle in the author byline? Are you an e-commerce fashion brand? Did you place the links at the end of your article to remind your readers, let’s say, about your best-selling product? Just like you can turn visitors into subscribers with email, with other engines you can turn them into social media followers, customers, watchers, or members. It’s not that every single article I write is great — it’s because I strengthen my “second chance” engines with every new article, gaining more subscribers, more followers, more clients, etc. This is probably the most important thing to decide before posting content on the web. After some time, you start feeling like an arrogant fool. You feel you are too much, or that your voice is too loud. I don’t think a personal brand is a bad thing, however. You just have to make sure it’s right for you. Gary Vaynerchuk writes great stuff about it, if that helps. Just be sure to pick the one that matches your personality and goals before the storm starts kicking in. Making an ideal combination of the two is also an option. Anything can get huge traffic at any random time. More on that in a minute. But first: Did you check if your hosting can handle the website traffic if your post goes viral? Did you test if your email subscription form works perfectly? Is your blog mobile responsive? Let’s start typing, now that we are all set with the pre-storm engines in place before a potential storm. 1. Write as simple as possible, but not simpler. Every time I wanted to impress my readers, I tried to write a sophisticated sentence pretending to be a real writer. However, I ended up over-complicating things and my editor kept inserting “What do you mean here?” comments. Obviously no one was getting what I was trying to say, even though my sentences were getting longer and longer. Let the real writers keep blowing our minds. Meanwhile, we’ll try to get our message across as clearly as possible. 25 words is a rough number; it’s a checkpoint I use every time I am stuck on a sentence. I then just shorten or split the sentence into two separate ones. The Hemingway app also does a similar job if you need help. This is something I keep doing, but I don’t really recommend it for others because I don’t think this is a proper way of writing. With our attention spans getting shorter every day, your article is competing for the attention of readers who have 12 other open tabs in their browser, not to mention never-ending notifications on mobile phones. In a world where people don’t even read my 140-character tweets, I try really hard not to put more than three sentences in a paragraph and keep things very to-the-point. Each article has a unique audience and each audience has its own problems. Just like you solve the problems of your users with a startup, I apply the same logic to my articles. For whatever industry or client, I start the article by identifying the problems of the audience of the story I am writing. This doesn’t mean you should always share intimate or personal stuff that people can relate to, though. Are you writing about the self-publishing music industry? Before starting, just ask, what are the problems those musicians face? You can also mix in a personal tone and write as if your reader is sitting right next to you. Seriously. Treat your writing like a startup. For most of my clients, I mix what I have learned from the guys at Buffer and Crew in a trio and this technique became a killer. Writing long form (1000–1500 words) always pays off. Sharing learnings increases the share rates up to 45 percent, and even further when backed with data or weird science. Test it yourself. 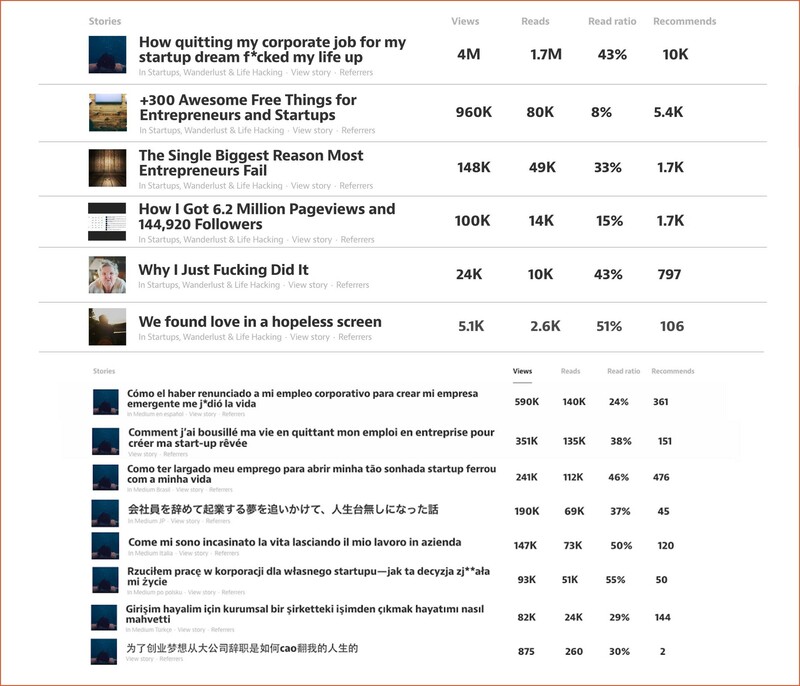 Try removing the featured image for some time and you will be impressed by how the analytics will change instantly. “How” and “Why” in a headline always works, and a “list” title never, ever disappoints (remember, it always depends on other factors, too.). You can also study some interesting headlines on the Medium Top 100 lists by viewing all the last months. Choosing a great headline is awesome and choosing a great featured image is great. But when you bring the ideal two together, it’s just perfect. This is, for me, by far the most important section of an article. You have a few seconds to convince the reader that you can fulfill the promise you gave in the headline. It’s in those few seconds that he/she will decide whether or not to open a new tab. Pull her into your story step by step. Change his mind so that he forgets he had actually landed on an article. Start with a shocking scientific result, an awkward detail, or a personal story. “That’s stupid — you’re building a lifestyle business,” spat the investor across the table, flashing me a death glare. I finished reading his article within a few seconds. Remember, you survived the introduction and pulled the reader into the body. However, the reader is still in the middle and she is already getting easily tired and is about to open a new tab. Insert a visual and let the reader breathe. There is a difference between giving credit to reliable resources and flooding your article with links just to prove to your reader that you wrote a high-quality piece. Always ask, is this resource really relevant? Does your audience really care? You are playing your final cards. The reader is really tired and has been going between so many open tabs and mobile notifications. Ease up and slow down. Write even simpler sentences. Keep your paragraphs shorter and your message even more to-the-point when possible. Recap all your points by showing how you fulfilled the promise, and send her home on a high note. Even when you finish writing your article, the real game is still to begin. This is something I do very often at the end of my articles that not many people do: I ask the reader to recommend or share the article. For some of my articles, this simple question has increased the number of shares by up to 32 percent. People are not mean — if they don’t share, it doesn’t mean they don’t appreciate your article. It’s just that some people simply don’t have the habit of sharing as much as you do. But often if you ask them, they are kind enough to share your work with their networks. The best time to send out an email campaign always depends on your audience, time zones, industry, etc. Generally, Sunday 0:00 GMT works for a global audience since people are usually looking forward to reading new things as the new week kicks in. However, I strongly suggest you to split-test the time you send out your newsletter. Many mail companies like Mailchimp offer growth-hacking tools to test sending the same email to two different groups of your subscribers. For instance, above is one of the old email campaigns I conducted for a client. Look at the shocking difference in opening rates, even though the two groups didn’t have that much of a time difference. Let’s say you have figured out the best newsletter timing for your audience to be Sunday evening at 6:45 p.m. Share the article on your social media accounts as soon as your email campaign is on its way to people’s inboxes. Send the first shot all together consistently across all channels, instead of weakening them by separating into different times. Always share the same post on your social media accounts a few other times over the next few days, covering different time zones. Slides and upload them on Slideshare, images on Instagram and Facebook, infographics on Pinterest, or into a video on YouTube. One of the best reproduction forms is to turn it into a website, a software, or a tool as a side project. Here is something I turned into a website after an article that became one of the most upvoted things on Product Hunt. The traffic you see on the Medium screenshots above is only a portion of the traffic you get. 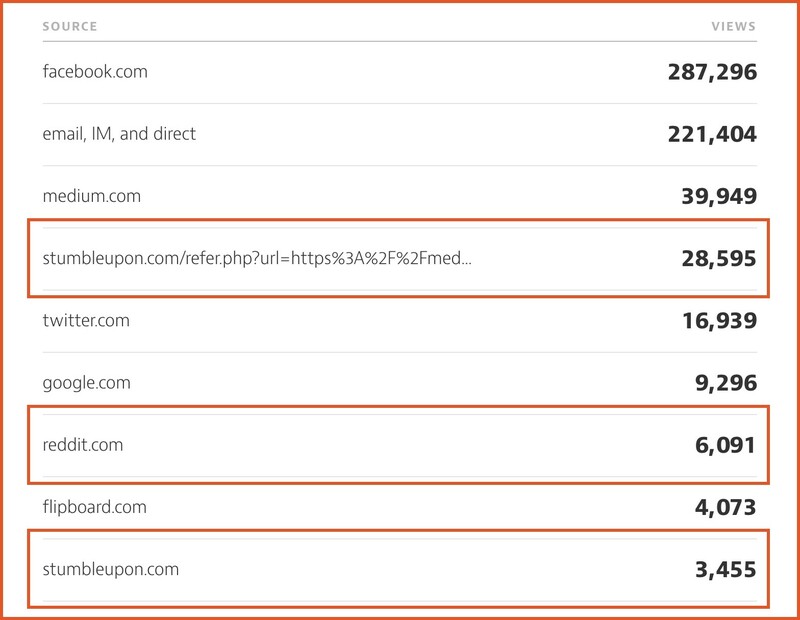 Redistributing on big publishers sometimes can up to double your traffic. What is really interesting is to see how people exaggerate big media outlets in their minds, seeing them as unreachable, unachievable channels that only the top guys get into. Here is how to give them what they need and enjoy huge traffic and exposure. Go on to the “contact” pages of your target publishers or tech blogs, and get the emails of editors. When there’s no email, search for them on Twitter. Make your wish list of target editors with all contact details. Remember: all they need is traction or proof of a performing article. If you can’t see the traffic on your Google analytics, there is no way you will fool the editor into reposting it on their website. Be to the point and brief. Talk about the results. And talk only if you have results. If your article is getting huge traffic or if you are seeing extreme movements in your analytics data, STOP. You don’t need to do any of the tactics above because you will be approached by those big media outlets within a few hours. Many of them have dedicated employees searching for trending articles on the web for reposting opportunities. With my viral story, I was approached by four top tech blogs within seven hours of publishing. Some media outlets will require you to sign exclusive agreements that prevent you from reposting on other outlets. It doesn’t mean exclusive agreements are bad; you just need to understand which channel has the best audience for that specific article. I reposted a viral article on multiple channels such as Business Insider, Lifehacker, and Tech in Asia. With some other stories, I go exclusively with The Next Web. If your piece is really strong, give it some time to spread on the main channel you publish on (be it your own blog or on Medium). Let it wear out at least for a few days; otherwise, big media outlets can easily cannibalize your main channel and split your “one bomb” into pieces. It all depends, however. For instance, the article below got more traffic on The Next Web than the Medium traffic below. Sometimes it takes time for your content to find the right channel. It took two weeks for this article to find the right channel: Someone uploaded it on Reddit and StumbleUpon. Eventually, from these two channels, it started going viral on Facebook. One of Jeff Goins’ articles about traveling started going viral one year after he published it when a student leader from Singapore shared it on Facebook with a travel group he led on campus. There is no right timing for an article to go viral; however, there is for sure the right channel. Instead of waiting for others, try looking for the right channel and submitting your links yourself. If your article has traction and global reach, Medium translates it in many other languages for you at no cost, and you enjoy the constant stream of followers and traffic to your links coming from other countries. If you are not writing on Medium, consider testing to hire a freelance translator once (I suggest Spanish) and ask one of the top tech blogs in the Spanish community to redistribute it. Unfortunately, many people will repost your article without giving you any credit. Some people will even go on LinkedIn and repost it as if they were the author of your articles. In my case, LinkedIn didn’t even respond to any of my emails where I reported these copyright infringement cases. If the number of copy cases is low and manageable, see what you can do about it. Otherwise, there is no point in freaking out and killing yourself over it. I always used to read those people saying “content is king” and I never understood the true meaning of it. As a millennial living in an extremely noisy world, I am finding it increasingly difficult to grab people’s attention and I start feeling the urgent need to become a better storyteller. In 2015, I really believe we need to start becoming better storytellers by improving our pitches whenever we talk to people. We need to become more to-the-point, where our voices are competing with their distracting mobile phones. Content is truly the king. You can grab the attention of millions of people with a simple story or an article. Never underestimate yourself or don’t use excuses, like that you don’t have a marketing budget. From your little desk in your little room from the middle of nowhere, you can generate more traffic than companies with an army of writers. Content is king, and you are the one who rules it.